Rebuilding your smile should be a satisfying experience. Thank you for letting us brighten your future. After your remaining natural teeth are removed, your denture is placed directly in the mouth so you will never have to appear in public without teeth. helps keep extraction sites from getting infected. It helps to learn to speak and chew. Eat a full meal before treatment, you may not feel like eating again that day. Take your prescribed medications at the proper time before your appointment. Bring a friend to drive you home. Tell the dentist of any concerns you have. We want you to be comfortable. Because of differences in tissue response, small adjustments may be needed as dentures "settle in". We allow 3 office visits at no charge during the first 3 months. What Is a Temporary Softliner? As you heal, your gums shrink, your dentures don't. After extractions, the space left by this shrinkage will need to be filled in with a soft gum-like cushion applied to the inside of the denture. Eliminate sore spots which will help promote healing. Tighten and stabilize the denture. Act like timy shock absorbers to cushion your chewing. Make it comfortable to speak. 14 days after extractions, please return to the office for a 20 minute appointment. You may feel it necessary to replace the softliner during the critical first 2 months of healing. A reduced fee of $39 will be charged per additional softliner. What Is a Permanent Reline? This lab procedure requires us to have your denture all day. Please make an early morning appointment and in most cases we will have your relined dentures back late that same afternoon. A reline can improve the fit of your immediate denture, however, it will not appreciably change the original placement or design of the denture teeth. The cost would be $454 per plate. A better option would be to invest in a custom denture to replace the denture you have been using during the healing. 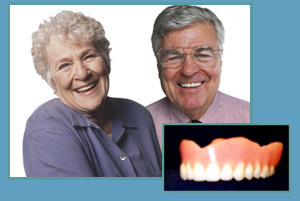 We offer a fine line of naturally characterized dentures to brighten your smile. For peace of mind on trips, vacations and for emergency situations, keep your immediate dentures as a spare.